Early in his career, Neil Lustig faced a choice: continue his fast ascent as one of IBM’s most promising engineers in a satellite office or take an entry-level sales position in its larger New York City location. His boss told him the move would end his career, within the company and industry. But his mentor argued the opposite. He said he’d hit a ceiling without exposure to both the technical and commercial sides of the business — and that he’d never lead without experiencing all the moving parts. The mentor, once a former engineer, oversaw a team of 7,000 people at the time. Lustig transferred to New York — and thrived in sales. He found that his engineering chops enabled him to explain technology in a way that moved people to action. He closed million dollar deals with clients like Citibank, and reached his annual quota in six months. Over the years, Lustig rose through the ranks to eventually lead IBM’s e-commerce solutions division when Lou Gerstner was at the helm. Every team he joined thereafter he earned more responsibility: as the GM at Ariba — where he helped shift the company to the cloud — to CEO and President at Vendavo to leading cross-channel experience management platform Sailthru. In this exclusive interview, Lustig shares how his management code came from his days coding —and how by drawing from that expertise, he’s grown into a more effective manager. He outlines everyday engineering practices that not only have helped him strategically direct companies, but develop the ‘soft skills’ needed to lead. Products, like teams and companies, are systems that address complex problems. This was an important realization for Lustig when he first made the jump from an individual contributor to a manager. To tackle his new set of challenges, he leaned on decomposition or factoring, which breaks complex systems into components that are more manageable to process, tackle and address. For Lustig, this doubled as strong management philosophy. When you get promoted, talk half as much and listen twice as much. You’ll connect faster and further with your ears. In companies even a tenth the size of IBM, senior leaders could randomly cold-call daily, and not connect with everyone in a year. When Lustig joined Vendavo, he scaled this method by organizing cross-functional teams of 6-10 people, so he could meet all 150 members in-person. “The objective was to decrease the perception of hierarchies and friction. That started with purposely not meeting with people with their immediate teams, but instead in functionally diverse groups. No team would have a manager or manager from their team in a group with them — it made it easier for them to be members of Vendavo than a specific role in engineering or sales,” says Lustig. Invest in languages — become a polyglot. Engineers can debate how many programming languages are needed to be a proficient developer, but knowing more than one has its immediate benefits. As is true with linguists, being aware of at least two languages can show the strengths and limitations of each of the languages by comparison. Even if you don’t fully achieve comprehension, you obtain a greater appreciation of other languages. Resonate before you educate. That doesn’t mean dumbing it down, but focus on dialing in first. 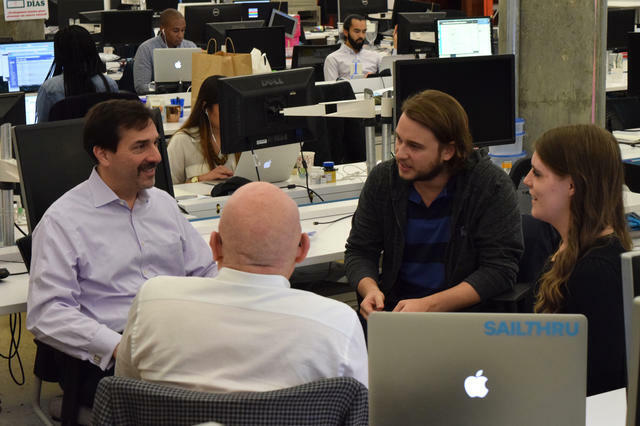 Sailthru’s practice of monthly roadmap meetings has generated results. “In a recent engagement survey, 90% of our employees said that they understand how their daily work contributes to the company’s goals. A through line from daily, individual work to overall company goals is so critical to me. I love that we are never more than 30 days away from checking in on it,” says Lustig. Victory for a leader is not being a part of every decision. Leadership is fixating on what ships, but more on the ship itself: the organization. That’s engineering at scale. When software engineers make the jump from owning lines of code to business lines, they should lean on their developer’s skill set to help guide the way. First, organizations, like software systems, are complex — use decomposition or factoring to break them down into manageable, modular units. Randomly test the integrity and health of your system by cold-calling employees. This will help you calibrate your understanding of progress — roll up your sleeves to help with specific challenges as thanks. Developers should be proficient in at least one dynamic programming language, but are upleveled when they know more — the same goes with leaders who are “conversant” in all the functional areas in their organization. Open source your roadmap, clean up management debt and broaden how you benchmark your abilities.